We love yogurt at our house! All types of yogurt…Greek, plain, and vanilla. There are so many ways to add it to your daily eating, too. Of course, we make smoothies with it and top it with fruit for a snack. 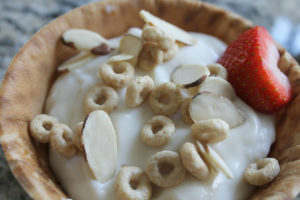 Many of my recipes use Greek yogurt as a substitute for butter or oil, as well. 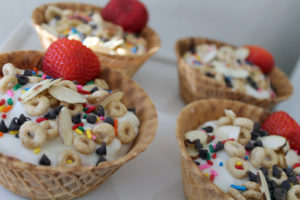 These yogurt sundaes are too cute to eat…however if you do, you might forget that you are eating yogurt and think it is a real sundae! They are that delish! 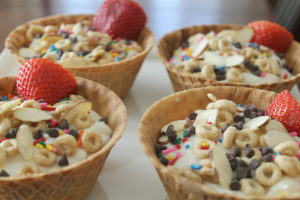 To make these, you will need waffle bowls, strawberries, lowfat vanilla yogurt, sliced almonds, honey nut cheerios, mini chocolate chips, and colored sprinkles. 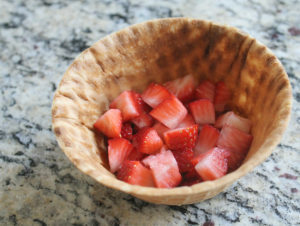 First, slice a few strawberries and place them in the bottle of the waffle bowl. Then, scoop some yogurt over the top of the berries. Add enough yogurt until it almost fills the bowl. Now here’s the fun part…adding the toppings! 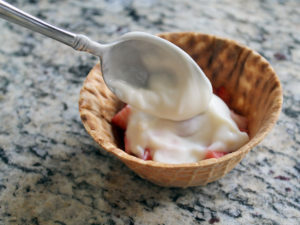 Cut a strawberry in half and place it on top of the yogurt. 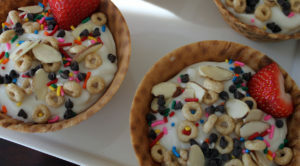 Sprinkle the cheerios and almonds on top. Then add the mini chocolate chips and colored sprinkles. 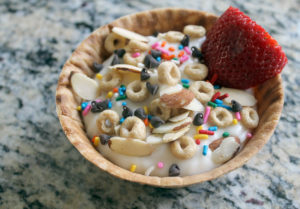 And there you have it…a yogurt sundae! 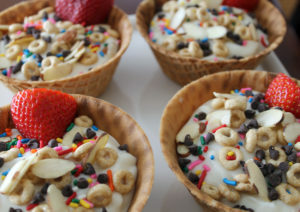 A perfect afternoon snack or a fun dessert! 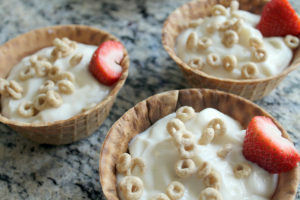 Just make sure you serve it right away, or the bottom of the waffle bowl will get soggy.